Pigs are very closely related to us as humans and as well as their own ailments they can suffer from a variation of human illness. Below is a list of some of the health problems we have encountered at Pigs Inn Heaven. Dippity Pig Syndrome this occurs in Spring time for no apparent reason and clears up as fast as it appears, keeping the area moisturised is important. Pulled Muscles/ligaments caused through pigs fighting. Arthritis/ Rheumatism caused through old age or injury. Deep wounds caused through fighting with another pig, generally caused by male pigs due to them having sharp tusks. Viral Infections these can occur just by the pig feeling a bit under the weather or when they have been moved away from their human family. Heart Attacks are a key factor in obesity, please make sure your pig as plenty of exercise and fresh fruit and vegetables. DO NOT OVER FEED YOUR PIG. 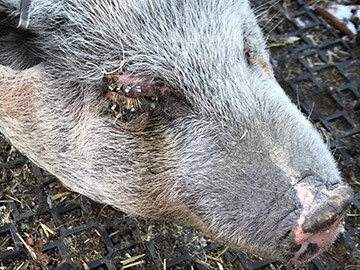 Cysts are quite common in pigs and a lot of the time are harmless, if you are unsure, a cyst is something that moves around and soft when you touch it, sometimes they are mistaken as Tumours if you are unsure please contact your registered vet for advice. Abcess these can feel like a cyst but contain infection and need to be drained by a vet. Strokes this can happen very suddenly, we have only seen this happen once in a pig of 4 years old and her back legs just gave up on her and she could not stand. Sore and Swollen Trotters this can happen when a pig is walking over rough areas and also if their trotters are too wet, they need both types of flooring but too much can cause sore feet. Dilute Fam 30 Disinfectant to a weak solution and make a foot bath for the pig/s to walk through twice a week, this helps to keep their trotters free form infection. If the area is cut use Septiclense to avoid infection. If a pig suffers with Bush Foot (Septic Laminitis) please get advice from your vet.